Conventional wisdom on the insufficiency of existing WTO disciplines on export restrictions has triggered momentum on the issue. 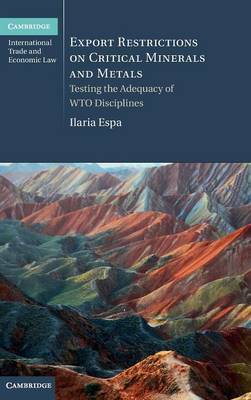 In this book, Ilaria Espa offers a comprehensive analysis of the scope and coverage of WTO disciplines on export restrictions in light of emerging case law. She investigates whether such rules still provide a sufficient, credible and effective framework capable of preventing abuses in the use of export restrictive measures on critical minerals and metals during a period of economic crisis and change in international trade patterns. Giving a broad overview of the export restrictions applied to these materials, Espa identifies distinctive features in the proliferation of export barriers and analyses the existing WTO rules to reveal their scope, gaps and inconsistencies. She goes on to present solutions based upon her findings with the aim of bringing more coherence and equity to WTO rules on the export side.